-- You’ve just had a life-changing event such as getting married, having a baby, getting a divorce, a death in the family, inheriting a large sum of money, etc. -- You and your spouse don’t share joint goals. -- You’re struggling to manage your debt and accumulated bills but haven’t changed your spending habits. -- You’re concerned about leaving a legacy for family members. 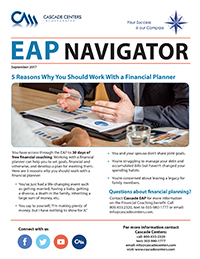 Contact Cascade EAP for more information on the Financial Coaching benefit. Call 800.433.2320, text to 503-980-1777 or email: info@cascadecenters.com.